The Accuplacer test funnels students into costly remedial classes that many probably don’t need. The nation’s colleges have made their admission decisions, and now, as college signing day draws near, high school seniors around the country are making their own decisions on where to attend. But most students will not be heading to an ivy-covered campus in the fall; in fact, today’s undergraduate is more likely to be a working adult at a community college. And for that student, the future does not depend so much on an admissions committee poring over grades, teacher recommendations, and extracurricular activities. Instead, it may very well depend on a single standardized test score—and not the one you’re thinking of. The test that matters for community college students isn’t the SAT. It’s one they’ve probably never heard of—let alone prepared for—until they’re told to walk down the hall and take it. The test most of these students take is called the Accuplacer. It’s a multiple-choice math and English test that schools use to decide who’s actually ready for college classes. Get into an elite school like Harvard and no one’s going to question your ability to do college-level work. But community colleges need some way to assess the academic skills of incoming students because pretty much anyone can walk into a community college and sign up to start a degree. That doesn’t mean you’ll be allowed into college-level classes, though. If you don’t do well on the Accuplacer, you’re probably going to be put in what are known as developmental, or remedial, classes. More than two-thirds of community college students end up in remediation. Some need to be there. But many probably don’t. The most recent evidence comes from an analysis published in September by the National Center for Education Statistics. NCES took a big set of data on college students and determined who was weakly prepared for college, moderately prepared, or strongly prepared, based not just on standardized test scores but also on high school GPA and the highest level of completed math coursework. (Research shows high school grades are a better predictor of how a student will do in college than test scores.) Then NCES looked at who ended up in remedial classes. Nearly half of the community college students who were strongly prepared by the researchers’ measure ended up in remediation. Ending up in a remedial class when you don’t need it is bad news. The classes cost money, don’t count for college credit, and add to the time it takes to get a degree. And while the NCES analysis found that remedial classes provided benefits for some weakly prepared students, they did nothing for strongly or moderately prepared students. In fact, those students were less likely to get bachelors’ degrees because more than a quarter of them didn’t finish their remedial classes. Why would this be? It’s not entirely clear, but researchers have some ideas. If you’re already juggling a busy life that may include both work and kids, college probably seemed like a precarious proposition to begin with. Having to sit through classes that aren’t “real” college courses might be what tips you into thinking this whole college thing just isn’t worth it. Plus, the longer the road to a degree, the more likely a life event—such as losing a job or a kid getting sick—could derail you. And people get discouraged. “A lot of students would say, ‘You know, I’m not even sure that I am college material,'” said Peter Adams, who taught developmental writing at a community college for 36 years. Adams is one of the pioneers in a movement to change the way remedial classes work. In a “co-requisite” system, students take remedial classes at the same time as college-level math and English, rather than before. The idea is to get students into college classes quicker, and provide remediation on the side in a “just in time” fashion. It works. Students in co-requisite remediation are significantly more likely to persist in college. But that still leaves the question of whether one test can determine who needs remediation in the first place—or whether it is measuring inequality more than ability to succeed in college. A wide body of research shows that test scores reflect family income more than any other factor. Adams once heard an official from a testing company say that instead of giving incoming students a placement test, colleges could just ask how many bathrooms in the house where they grew up. The fewer bathrooms, the worse they’re likely to do on the test. And the more likely they’ll end up in remedial classes. There are certainly low-income students who do well on tests. But those students are not, for the most part, ending up at elite colleges. Only 23 percent of high-achieving, low-income students even apply to a selective school. Almost half of students from the lowest-income families go to community colleges. So do most Hispanic students and 44 percent of black students. And if you end up at a community college, test scores may be your only ticket into college-level math and English classes—even if you’ve already proven you can do college-level work. I met Sarah Keehner her last year while working on a documentary about remedial education. Keehner is dyslexic. She knew she wouldn’t be able to score out of remedial English on a standardized test. But she found a workaround, or so she thought. She signed up to take a college-level English class in the summer semester at her local community college. For some reason, no one made her take the Accuplacer first. She got a B in the class. But when Keehner went to sign up for the next semester’s classes, a counselor noticed she hadn’t taken the Accuplacer. She was told to take it, did as badly as she’d predicted, and was placed in remedial English. Another student I met, Tyler James Karl, started at a private liberal arts college that doesn’t even offer remedial classes. He was doing well, but his family was having financial problems and he had to come home after a semester. Karl enrolled at his local community college and, even though he had already passed several college-level classes, was told to take the Accuplacer. He ended up in remedial math and English. Community colleges rely on the Accuplacer because they may not have access to transcripts or other academic information about a student, especially if that student is older or previously went to school outside the United States. But even when colleges could access transcripts or other academic data, the default is often to just look at test scores. A system that uses test scores as its only indicator is inevitably going to discount the potential of many lower-income students. And while the Accuplacer probably does catch certain skill deficiencies, are those skills needed to be successful in college-level classes? In the cases of Keehner and Karl, apparently not. And they’re not anomalies: two studies released in 2012 suggested that up to a third of community college students assigned to remedial classes based on placement test scores alone could have gone straight to a college class and earned a B or better. And what about people who already have college degrees? I graduated from college more than two decades ago. I wondered how I would do. So last year, I arranged to take the Accuplacer at a community college. I went in cold, with no prep, like most students. I did fine on the English—a relief, since writing is what I do for a living. But some of the questions were tricky, and with no prep, I wasn’t quite sure what I was being asked to do. On the math, I tested into remediation. (You can try some sample questions here.) At that point, if I were really going back to school, I would have asked if I could brush up on my algebra and re-take the Accuplacer. At some schools, even that’s not allowed: the Accuplacer may be a one-shot deal. 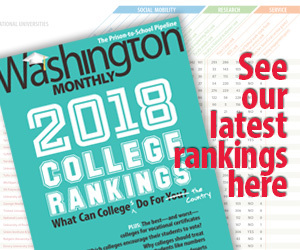 Imagine if we told all those high school seniors competing for spots at the nation’s top colleges that they could take the SAT just once, instead of getting to add up their best scores from several rounds of testing the way many elite colleges allow them to do? Placing a majority of community college students into remedial classes based on a single, questionable test score is a relic of this outdated attitude toward higher education. Even the College Board, the company that makes the Accuplacer, says a test score should not be the sole determinant of who needs remediation. The high school seniors privileged enough to be considering offers from elite colleges were not accepted based on their test scores alone. In fact, a growing minority of selective colleges don’t even require applicants to submit scores. It’s time for community colleges to stop relying so heavily on test scores, too. Emily Hanford is senior education correspondent for APM Reports and the producer of the audio documentary Stuck at Square One: The Remedial Education Trap.